I haven't been in much of a sewing mood lately other than the hand work. But this evening I picked up one of my UFOs and started working on it again. I have this piece that is already pieced, backed and quilted. And I had some pieces of "scraps" that were left from piecing this part. So I pressed, cut to trim up and started sewing them together. I think it is as wide as the other piece. If not I can just add a bit more onto it. Ha ha...I have been watching a British sitcom and I tend to pick up phrases. Did you hear my English accent on the "add a bit more onto it" part? 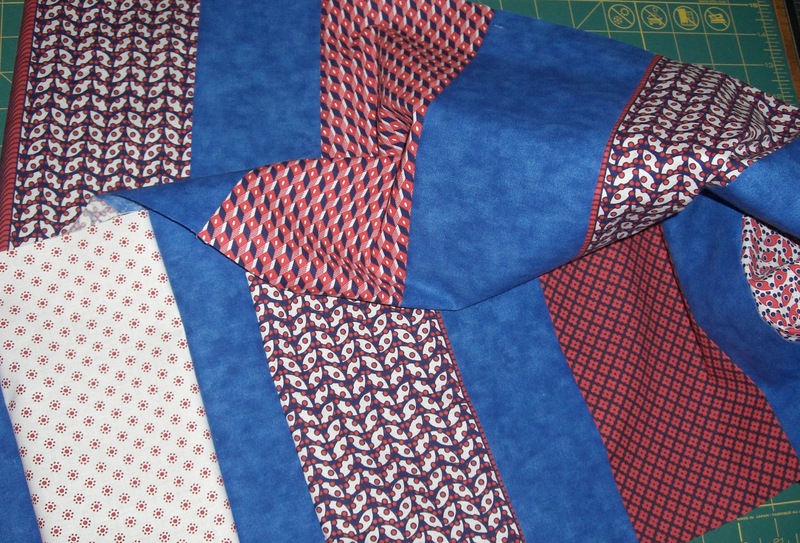 This quilt will be done in a quilt as you go manner. It is also a make it up as you go pattern. Strangely those seem to work out best for me. 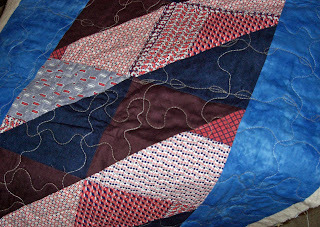 The back of the piece that is already quilted is pieced also. This will be a reversible quilt. I love making them that way. 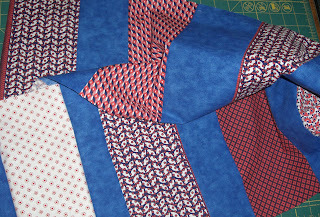 In other news I saw the announcement that I won Second prize in the Quilts of Valor Blog Hop. I will be getting a delightful set of Aurifil threads. It is the Basics Collection by Mark Lipinski. Thanks to Marjorie for hosting the hop! Love what you have been up to. My husband tells me all of the time that I will be talking with a British accent if I keep watching bbc series...love them! Nice!! Congratulations on second place!!! Congratulations on your win! That's great! I think your quilt is coming along swimmingly. (I said that in a British accent, too! It comes out kind of funny mixed in with my Texas accent, though! )We went to London a few years ago and you should have seen the looks we got when we opened our mouths.